The Microline Surgical MiSeal Reposable Thermal Ligating System can cut and seal soft tissue in one stroke. MiSeal is comprised of a reusable handle and disposable tips, combining the precision of a fully disposable instrument with the economic benefits and quality of a fully reusable handpiece. Unlike conventional products that use monopolar, bipolar or ultrasonic energy as modes of operation, MiSeal features proprietary tissue welding technology, which employs direct thermal energy and focused pressure to create a high-integrity seal and a clean division, while minimizing the risk of collateral tissue damage. The 5mm MiSeal features heating elements at the distal tip, which are activated by a finger switch located on the handpiece of the device. 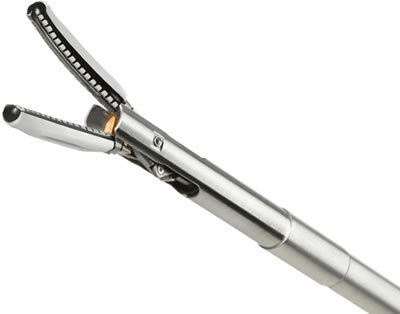 The instrument's dual-action jaw can be used as a dissector or grasper, minimizing instrument exchanges and improving efficiency in the operating room. MiSeal is powered by the Universal Power Supply (UPS), a compact, three-pound, reusable power source that can hang from an IV pole or sit on a tabletop, offering ease of set-up and use, which can reduce procedure and clean-up time. 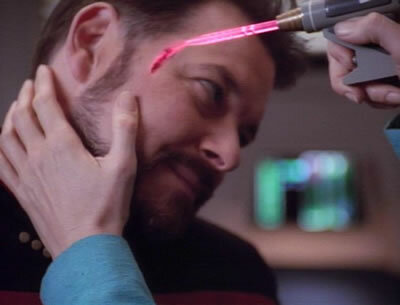 Fans of Star Trek: The Next Generation may recall the dermal regenerator, as shown below.